What are the attributes of a female’s view of landscape? Whenever a discussion moves to the topic of what constitutes women’s art, most sensitive (and sensible) folk know that a change of subject is necessary and required quickly. In short, the topic verges on taboo; a bit like chatting idly about religion and politics around the dining room table. While not disregarding that any discussion of what constitutes a female’s view of landscape is problematic—even more so when an answer is being proposed by a man—the question is not really about a how women see the landscape so much as the differences in women’s vision to the way men look at landscape. After all defining most problems involves comparison with what something is not. But before I set forth on what must be shaky ground of political correctness, I need to make my position regarding the following discussion very clear: my views are based solely on personal experience and reflection as a teacher. They are not the outcome of formal research and fact-finding missions. Instead, I see the following “answers” as an initial framing of ideas—very raw beginnings—and platforms of departure for future formal investigations into feminine ways of looking. Let me begin by focusing attention on the passionate French painter-printmaker, Angele Delasalle (1867–1941). 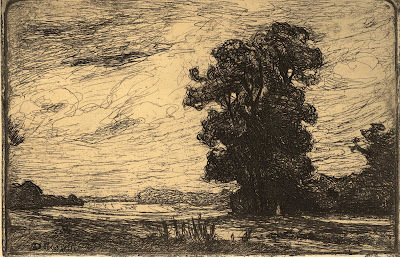 As shown in her etching, Montigny-Beauchamp (1907) (see below), Delasalle’s portrayal of landscape reveals an artist who has a well-formed personal perception of her subject. This is expressed in part by the uncompromising confidence of her line work with its signature style of freely laid and looped strokes that are clustered in shadow areas and spread out in the light. Delasalle’s perception of landscape is also expressed by the consistency of her approach: a type of pictorial democracy where no individual landscape feature is treated differently to the next. By this I mean that each feature is depicted in the same broad (i.e. non specific) way rather than each feature having been rendered to show its specific attributes of texture, sheen and incidental detail. I am selling this print for $185 AUD including postage and handling to anywhere in the world. Please contact me using the email link at the top of the page if you are interested in purchasing this print. Delasalle’s pictorial democracy is not in itself a hallmark of a feminine disposition. After all, the truly memorable male artists (such as Claude Lorrain whose consistency of style I discussed in an earlier post) portrayed their chosen subject with a singular vision. The element that makes Delasalle’s stylistic consistency feminine is what is missing at the centre of vision: a distant point of focus. Essentially, I wish to argue that Delasalle has showcased a peripheral field of vision (i.e. vision glimpsed from outer boundaries of the eye) and this interest in what is occurring outside the centre of vision is the attribute of a feminine way of looking. 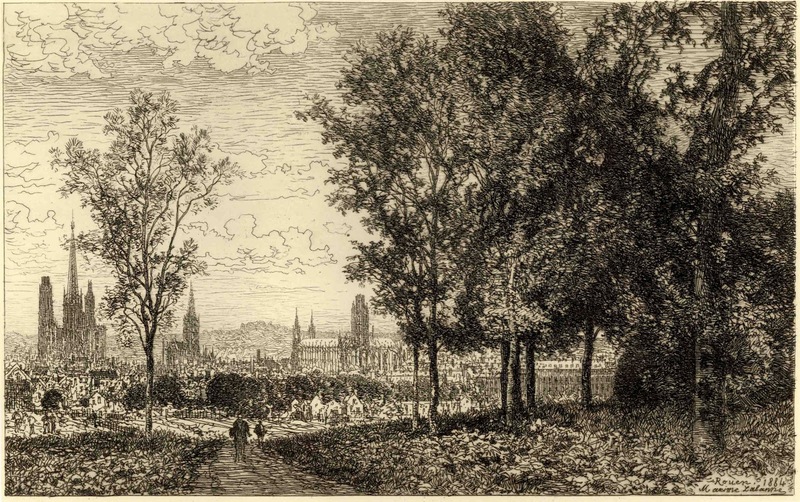 Compare, for instance, Delasalle’s portrayal of landscape with the tunnel vision of Maxime LaLanne’s (1827–1886) etching, Rouen (1884) (shown below) to see what I mean. In Lalanne’s landscape the funnelled focus on the distant spires is a man’s vision—the primeval hunter contemplating distant prey—whereas Delasalle’s landscape is like a mother’s overview (i.e. the “big picture”) of the surroundings to protect her children from any potential danger. Perhaps this argument of separating man’s vision from women’s vision based on foveal (i.e. centre of the eye) and peripheral propensities has a few flaws. 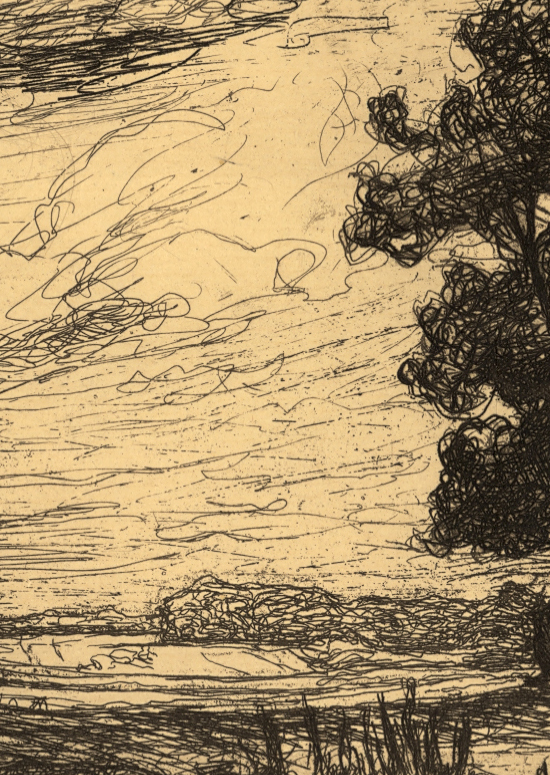 For example, B. Dufernex, a critic at the time of Delasalle, saw her art practice as “the work of a man” (Magazine of Art, 1902) because of her “characteristic energy.” But one only has to look over the history of art to see male artists’ leaning to tunnelled perspectives with a single point of interest and female artists’ leaning to broadly scattered points of interest. I am selling this print for $80 AUD including postage and handling to anywhere in the world. Please contact me using the email link at the top of the page if you are interested or click the “Buy Now” button. Another attribute that I have discovered during my teaching experience is the female fascination with pattern and texture. For instance, when students are asked to take photographs in the landscape that they can later use as reference material, the men tend to find natural phenomenon like oddly shaped trees and rocks while the women are drawn to textures of bark and shadow patterns. The same fascination with surfaces applies to the way women tend to make images. In the case of Delasalle’s print, notice how the line work appears to be woven like a textile (see detail below). 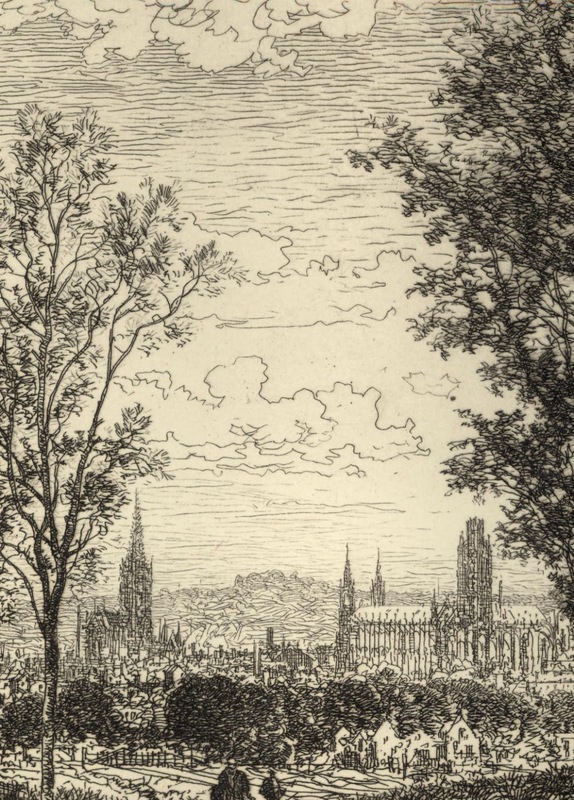 Then compare this treatment with the line work in Lalanne’s print (see detail further below) and how different the marks are laid. This difference could be summarised (with much generalisation and tentativeness) as suggesting that women have an interest in expressing their experience by tactile representation whereas men have an interest in figuratively portraying what they see. The last attribute that I wish to propose is all about different mindsets. Without too much apologising for making sweeping statements, I wish to suggest that men lean to an analytical way of looking whereas women lean to intuitive response and feeling. This reality is clear when comparing Delasalle’s vigorous looping marks suggesting an authentic gut-level experience of landscape and feeling its mood and soul with Lalanne’s much more clinical approach of being ever mindful that the finished image is meant for public scrutiny.